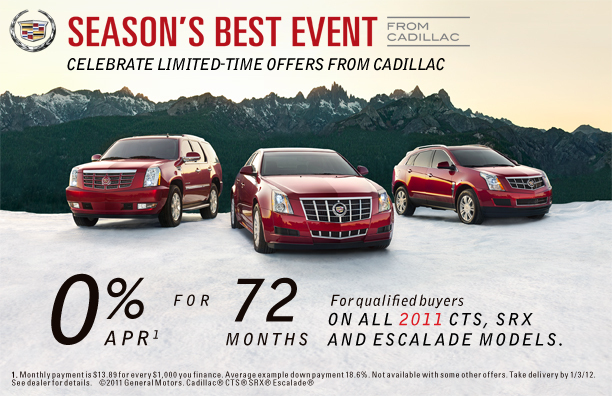 Uftring Weston Chevrolet Cadillac in Peoria, Illinois is excited to announce the Cadillac Season's Best Event - where we are offering 0% Financing for up to 72 Months on new 2011 Cadillac CTS, SRX and Escalade models. We are the Cadillac dealer in Peoria Illinois you should see if you want to save thousands of dollars on the financing alone. Just in time for holiday shopping, Uftring Weston still has a great selection of new 2011 Cadillacs for sale. Visit us at our location at 3622 N. University in Peoria for a test drive today. Treat yourself to a new Cadillac for the holidays, during the Season's Best event at Uftring Weston Chevy Cadillac in Peoria. All financing to qualified buyers. See us for complete details. Expires 1/3/12.